Read it 30 plus years ago when they first came out. Good books. I lost track of the last few entries in the series though. I met Glen Cook at a SCi Fi/Gaming convention in the late 80s. 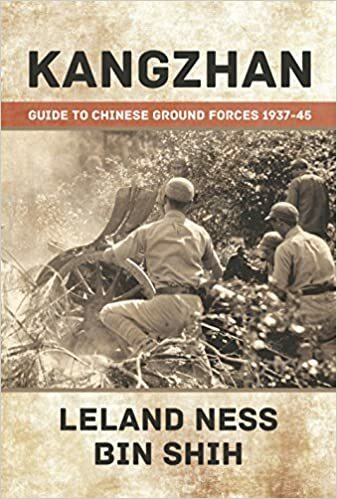 Kangzhan: Guide to Chinese Ground Forces 1937–45 is the first ready reference to the organization and armament of Chinese ground forces during the Sino-Japanese War of 1937–45. The work integrates Chinese, Japanese and Western sources to examine the details of the structure and weapons of the period. Recent scholarship has contributed greatly to our understanding of China's role in the war, but this is the first book to deal with the bottom-level underpinnings of this massive army, crucial to an understanding of its tactical and operational utility. This book is currently the best resource in English for the Chinese Army of the period. Its breadth of material is impressive, covering all types of weapons (imported and locally produced from small arms to armour and artillery), organization and training for all the various forces fighting on the Chinese side (including the communists). One improvement over Ness' previous two volume work on the Japanese army, Rikugun, is the use of a heavier glossier stock for the pages which means the photo reproductions (and there are a lot of images in this book) are much crisper and easier to make out. If you have any interest in the Sino-Japanese conflict of the period this book is essential for your library. Judging a book from its cover, it reminds me a bit of Robert Harris' Fatherland. Any truth in that? Let's hear it from Sergio! Came across it in a charity shop and I have only just started it so it is a bit difficult to make a full comparison to Fatherland but it is interesting so far and it is based on the case of Georg Heuser. The idea of a man who was involved in tracking down the S Bahn serial killer and how he (and those like him) in turn became a mass murderer and part of the Holocaust is a good one. It has, also, made me ask or think about a few things so that is a good sign. A lot of the people in the book really existed, a lot of the events are historical but obviously many of the conversations and thoughts will have been made up. Overall not too bad so far but there have been a few awkwardly phrased bits of writing that stood out. I have not read Phillip Kerr's books. It has, also, made me ask or think about a few things so that is a good sign. I agree, this is always a good sign if a book does that to you. With this sort of books, set in Nazi Germany, I often wonder what I would have done if I had lived in Germany in the thirties and early 40s and the result does not make me feel proud of myself. Thnx Sergio for this mention, I have put this book on my wish list. My pleasure. The book does seem to have got some reasonable reviews, lets hope the rest of the book matches those! That is the question is it not - how would any of use have acted during that horror show. Or perhaps how do many people act now with all that is going on. How many would keep quiet out of fear or worse how many would eventually actively go along with it. Last edited by Sergio; 25 Aug 16, 15:43. Shattered Sword the untold story of the battle of Midway. It is told from the Japanese side. I am currently reading The Adventures of Huckleberry Finn by Mark Twain. Currently reading Joby Warrick's "Black Flags: The Rise of ISIS", winner of the 2016 Pulitzer Prize for general nonfiction. The major book sections are 'The Rise of Zarqawi', 'Iraq', and 'ISIS'. I was attracted to the book for the section on Zarqawi. In my International Security course, I taught students to identify dots in a large number of reports and sources and how to connect dots for an answer to a question, and in this case, "How did the United States finally track and kill Zaqarwi at a remote safe house outside of Baghdad?" The first dot was Zaqarwi was a Jordanian. I'm learning a lot on Zarqawi and Jordan in the early days as well as the dots for the rise of ISIS. A Golden Oldie " The Road to En-Dor by E H Jones which describes how he and another British Officer using the skills of fake mediumship managed to con their Turkish captors into eventually repatriating them in 1918. Neil Gaiman recently adapted it for film but I have not seen this. Interestingly the British SF writer Eric Frank Russell nicked the essentials for "Next of Kin" in which a downed Terran recce pilot cons his way out of a POW camp on a far away planet using the same methods. All times are GMT-5. This page was generated at 21:21.